Optimizing Me: Weekly Challenge: Budge...t what? Yay for a week of self-love and care! How did you enjoy yours? I felt like I had some great variety throughout the week. I had a massage yesterday, went for a bike ride, read a book, practiced positive self-talk, planted a square foot garden, practiced a little retail therapy ;0), and even gave myself permission to give myself a break more often! It certainly wasn't all roses since I had a pretty sick baby this week but appreciated the challenge to make even a few minutes to take care of myself. I hope you found it beneficial too! Quickly changing topics now... Yep, I'm going to say the word that pretty everyone doesn't want to hear.... BUDGET. There, I said it. Phew... glad that's over with :) I find it incredibly difficult to be the best version of ourselves when we have constant stress and worries about finances. I've got plenty of ideas for this week's challenge so you can decide on a good starting point for you, depending on your situation. When I first got married, I really hated talking about our finances. We both seemed to have different priorities & it always felt a little heated & maybe even a little accusatory back and forth. You could tell we both didn't enjoy it & only talked about finances occasionally because we knew we should. What I realized, is that we both didn't like talking finances because we had different views on them & priorities. I'm here to say, that having different goals within a family can work! It may make financially chats a little more challenging initially but it's doable! So instead of fighting the fact that my husband and I had different financial views, we embraced it and shared them with each other. From there we were able to develop financial goals as a family that satisfied everyone. For instance, it was really important to me to pay off debt & not take 3 years to pay off a washer & dryer just because there was no interest until then. My husband really wanted to prioritize a vacation & have a minimum amount of savings by the end of the year. So we looked at our income, created a budget, & developed a plan to make sure we were both accomplishing our goals. And trust me, the more you talk about finances with mutual respect, the easier it gets. I actually really enjoy talking about finances now. I know... crazy, right? 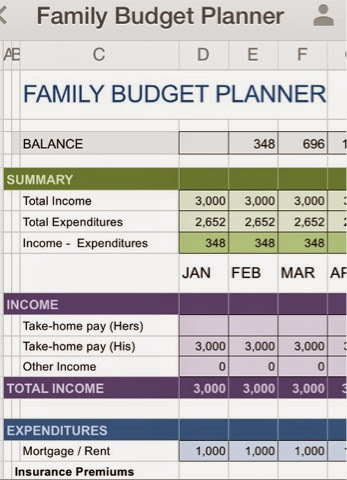 I've said it before but it's amazing how much you can do with your income when you have a plan & know exactly where your money is going each month. It gets really exciting to make dreams reality & dream even bigger! Buying our last car with cash felt amazing. The next goal is to never have a house payment again! Without further ado, the challenge this week, is to develop a financial plan or if you already have one, evaluate it & proactively act on it. Read up on Dave Ramsey's 7 baby steps, or even better, read The Total Money Makeover! Develop a budget. There are many free templates online. Regardless of the tool you choose to use, you have to know how much is coming in & how much is needed for monthly expenses to ever spend less than you make. You may discover that you have more left over than you thought (that often disappears from mindless spending) or you may realize that more income needs to be made to even get by without relying on credit cards. We have a monthly & yearly budget to help keep us on track. If you already have a budget, maybe it's time to get your Debt Snowball rolling. Here is some great info from Dave Ramsey but it essentially entails using any money remaining each month to pay off debt, starting with the smallest dollar amount. It's really cool to feel the moment build as you pay off one thing & move on to the next until there's none left & that extra money is yours to do what you want with it! Sign up with Mint.com. It's a free, convenient, and safe way to create a budget & actually see how you're doing with it each month. All you do is create an account, link your bank accounts & then categorize your transactions each month. It takes a little bit of time to initially link your accounts but then it saves so much time later by not having to count receipts & manually track your spending each month. You can see trends in your spending over time & set up savings goals. Another cool thing about mint.com is that you can import the data into Turbo Tax when it's time to do taxes! We've been using Mint since 2009 & love it! Decide how often you will go over the budget. We do it at least once a month as we're closing out & categorizing transactions in mint for month end. At the end of each year, we like to evaluate our spending & talk about what went well, the unexpected items that came up, & talk about our needs & wants for the new year. If you're past having debt, maybe it's time to start really building wealth & saving for retirement. Consider meeting with a financial counselor or check out other ideas here. What ideas do you have to create or implement a budget plan this week?